Fundraising is essential to your organization. Whether you are raising money for your annual fund to keep operations in check or for specific campaigns to fund particular projects, you need to maximize your use of your fundraising efforts. Ready to learn more about how your fundraising CRM can skyrocket your fundraising efforts? Let's jump in! What is a Fundraising CRM and How Can it Help Streamline Donor Data? A fundraising CRM is a storage facility for your donor data. This important software helps you compile important information about individual donors and fundraising campaigns. The first feature that your fundraising CRM offers to your organization is the ability to streamline your donor data. When all of your donor information is found in a single location, it's easier to apply this data to your fundraising strategy. Many nonprofits only include the information that donors put in their donation submissions into the donor profiles in a CRM. Some even go a step further and include each donation amount. While this is a great start to building profiles, there's so much more you can do. Donor documents. Be sure you can store various external documents for each donor. For instance, you may want to store a PDF, Word document, Excel spreadsheet, etc. that relates to the donor. Segmented donor groups. Save the demographic information of donors into their donor profiles so that you can segment groups of donors based on this information. For instance, you may want to group all of the donors in a particular area together if you have an upcoming fundraising event there. Relationships. Track the relationships that your donors have with one another as well as their relationship with organizations. For instance, you may want to save the information that one of your donors is in an executive position with another local nonprofit. Notes. You can add notes to a donor's profile at any time from any internet browser. Be sure to place each note in a category according to its purpose, such as an event incident, received phone call, or meeting notes. When you have all of this information in a single location, it is much faster and easier to draw the information you need to plan your fundraising efforts. For example, if you are hosting a silent auction event, search through your donor software to find donors who are also local business owners. They would likely love to donate to your event. Then, if your donors are segmented by area, you can reach out to the close-by supporters with targeted invitations. Salsa's fundraising CRM offers complete donor profile customization. Not only does it empower you to input all of the information featured above, but you can also build custom fields to store additional information that you may find useful. Streamlined donor data is just the beginning. Your fundraising CRM should be able to do even more for your organization. For instance, maybe it's connected to your online fundraising efforts! If you have separate systems for your online fundraising and your donor database, you could be wasting a lot of time switching between software solutions! When your online fundraising is integrated with your fundraising CRM, more work can be automated to ease your workload for your fundraising campaign and future data storage. When your online donation pages are hosted through the same software provider as your CRM, new donor information can be automatically saved to a new donor profile in your donor database. You'll no longer need to input new information into your database by hand; your software can do it for you! For instance, when your fundraising CRM is integrated with your peer-to-peer fundraising pages, you'll find it much easier to store information about new donors as well as donor relations. Peer-to-peer fundraising enables your supporters to create fundraising pages and raise money on behalf of your organization through their online networks. Therefore, when a new donor gives to a supporter's fundraising page, you can automatically store the connection between the two donors. When you have access to everything from online donations to event registrations tracked in your fundraising CRM, you can also send thank-you messages directly to the email address of your contributor. Automate these messages so that your constituent will receive acknowledgement right away. Salsa Engage pairs with Salsa CRM, giving you access to various fundraising and marketing tools that integrate seamlessly with your donor database. While some may say that "snail mail" is too old-fashioned, it's proved to remain an effective fundraising technique! While online fundraising may be trending, especially among your Millennial and Gen X donors, a 2018 giving report shows that almost 20% of Baby Boomer generation donors still prefer to give through direct mail. Hint: This would be a great way to segment your donors in your CRM. Reach out to different generations and emphasize their general preferred method of giving through your marketing strategy. When you set out to raise money through direct mail, start with a general fundraising letter template. This template should include things like the amount you want your donor to give and the campaign the donation will go towards. Then, you can customize the letter for the campaign and donor you're writing for. Saving the customized fundraising template in the CRM so that it can be used for this campaign as well as to structure your letters for future campaigns. 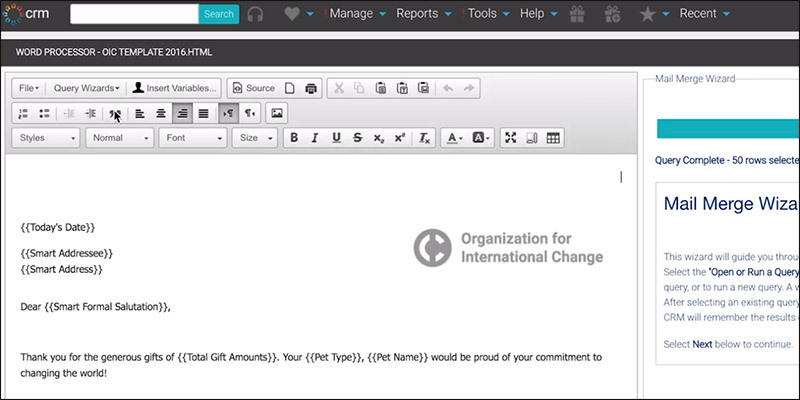 Auto-populating the donor's name into the fundraising letter template so that it's easy to print and send a personalized greeting to each donor. Auto-generating mail labels from your donor lists. All you need to do is select the segment you want to send mail to, then let the software flow their personal information into the letter template and create personalized mail labels. Personalize each letter for donors using their names and suggested giving amounts identified through prospect research. These letters have a much higher success rate than those sent to a general audience. Consider this: When was the last time you got a letter addressed to "Dear Donor" or even "Dear Valued Customer"? You probably threw that letter straight in the trash. But when someone uses your name (even better, your preferred name), you'll pay more attention. Salsa's fundraising CRM software solution offers direct mail fundraising tools to get engaged with donors. Leveraging this tool will save your organization tons of time stewarding because it eliminates the necessity to write out each individual's information. Your fundraising CRM is more than a simple donor database. Not only can you track your information about your donors, but you can also track information about your donations themselves and how they contribute to your campaign. Campaign the donation goes towards. Person the donation is in honor or memory of. Amount of the donation that is tax deductible. Be sure to send acknowledgements to your donors for their gifts using this tracked information. While an immediate "thank you" shows your appreciation, an official gift acknowledgement provides your donor vital tax and donation information. Your fundraising CRM should also have the ability to track more than straight donations. Track your pledge campaigns here so that you can measure their success rates in addition to your donations. Both your donation and pledge campaigns are incredibly important to your fundraising campaigns, so they should both be tracked through the same CRM software. Plus, when you track your promised gifts in your fundraising CRM, you can set up automatic reminders to send to those who pledged. Instead of allowing your pledges to fall through the cracks with people who may have forgotten their pledge or misplaced your information, you can follow up and remind them of their promise and provide a method of giving. Tracking all of this information in your fundraising CRM makes it easy to then export all of the necessary information to a separate accounting software for comprehensive financial reporting. Your fundraising CRM should enable your organization to view custom reports online, then download them to take with you on-the-go. This way, you'll always have the necessary reports on hand for meetings or conventions. Look for a fundraising CRM that will provide you with more than a simple spreadsheet of the numbers. A performance dashboard with visuals and analytics right there for you to see makes it easy to see trends in your fundraising campaigns. Donor retention and potential retention. Specific campaign trends and success rates. Customize your reports to view analytics for specific campaigns, individuals, segmented groups, and other metrics you may find useful. Accurate reports help you to customize your future efforts for the best possible donor relations. For instance, you may see that your pledge campaign has increasing numbers of outstanding pledges. Therefore, you should reach out to these supporters more to build extensive relationships. Maybe you'll decide to set up more reminders about the campaign as a solution to the report. Reports enable your organization to make the best possible next steps to increase your overall future fundraising success. While we all love seeing positive reports, the negative ones are where we can see opportunities for improvement! Salsa's performance dashboard provides all of this information at your fingertips. You can see all of your fundraising information in real-time. Plus, you can save custom reports for future reference. With the right fundraising CRM, you can not only save important information relevant to your donors, but you can also boost your fundraising efforts. By using integrated systems like Salsa CRM and Salsa Engage, you'll save an abundance of time that would've otherwise been spent switching between systems.